"Gooooaaaaallll!!! 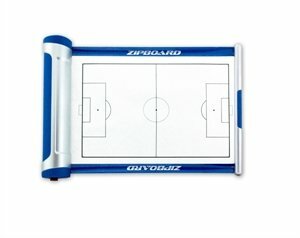 No more carting around bulky clipboards or oversized dry erase boards! Zipboard is the first and only portable, retractable whiteboard that users can wear on their hip or stow in their pocket, backpack, or equipment bag. Once extended, this patent-pending product is a rigid, erasable writing surface that comes complete with a stowaway dry erase marker and eraser. This version is perfect for Soccer coaches to diagram plays during the game or drills during practices. Each Zipboard comes with 1 Beltclip, 2 Strap Hooks, 1 Dry Erase Marker, and 1 Dry Erase Eraser. Shoulder strap not included. If you have any questions about this product by ZIPBOARD, contact us by completing and submitting the form below. If you are looking for a specif part number, please include it with your message.